I was delighted with my first attempt to pickle cabbage. 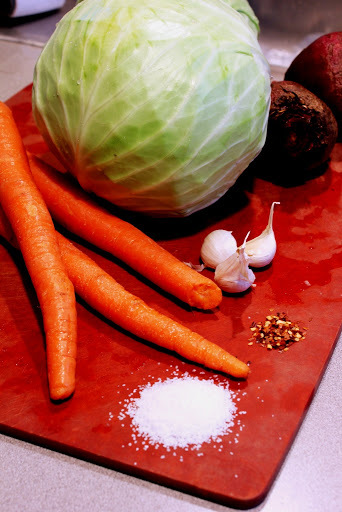 The cabbage, mixed with carrots and salt turned out crisp and savory. It was the taste of my childhood. My parents were proud and soon enough the jar of cabbage was empty. I was ready to pickle again. 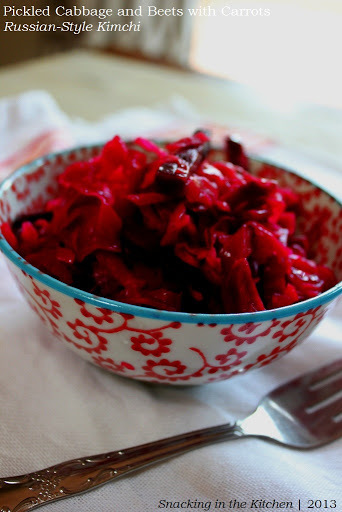 This time, in addition to cabbage, carrots, and salt, I decided to mix in beets, garlic, and red pepper flakes. Keep on reading to see what happened. 1. 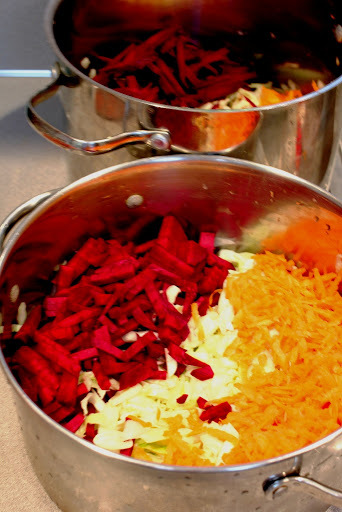 Mix together cabbage and salt in a large stainless steel pot or a food grade plastic container. I admit, my pot wasn’t big enough, so I made this in two batches and then combined together. 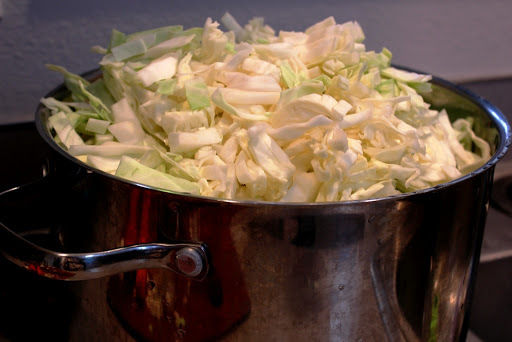 When you mix the cabbage with salt, the cabbage gives off juice and significantly decreases in volume. 2. 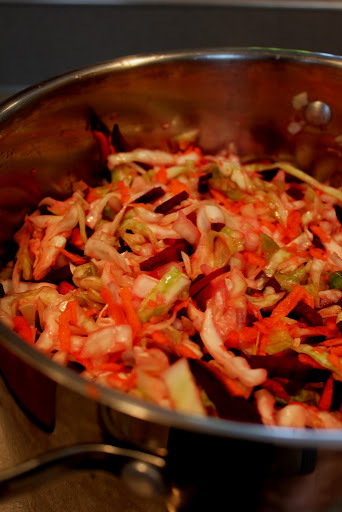 Stir in beets, carrots, garlic and pepper flakes. 3. Weigh down the pickled vegetables. I placed a plate on top of the vegetables and added a pot with water on top. You could use canned goods or anything else that is heavy. Leave the vegetables at room temperature for 6-7 days until vegetables pickle. 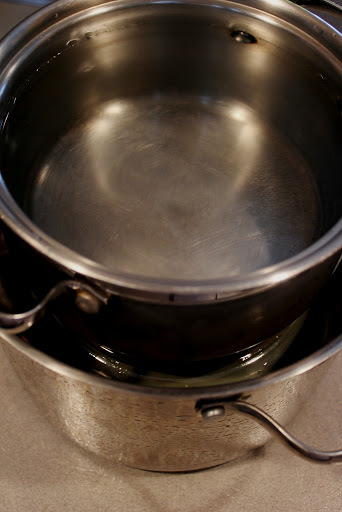 If you notice that the vegetables are dry, remove the weight and stir them together – there will be plenty of juice accumulated on the bottom of the pot. Taste the vegetables on day 5 or so. If there isn’t enough salt, you can add another tablespoon then, as well as more red pepper flakes. 4. 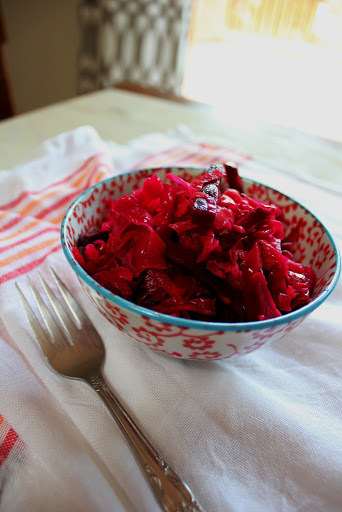 Refrigerate the cabbage and beets until ready to use. Eat as is or dressed with oil, chopped herbs and minced onion. I just might add more garlic and red pepper flakes next time. Also, this time around I sliced the beets but would shred them next time. What do you think? So excited for you to try this! Please follow up and let me know how it tasted for you. Enjoy! I make something similar, however I also add bits of APPLE, can you say YUMMY! I can’t find a something to place on top that fits exactly. There is a small edge of the cabbage that is open to air. Does the mix have to be completely covered while weighted down? Previously I tried a recipe like this that was in a canning jar and the top oxidized because it didn’t have juice over it. It looked horrible, but underneath it seemed fine. I threw it out because I wanted to be completely safe. Can you advise on what to do if no lid will fit exactly? Thanks for your question. A little bit of the cabbage will naturally be uncovered. Don’t worry about it. You can mix out together once a day. Hope you give this recipe a try and enjoy the results. Please write back and let me know how it came out.